Tari Lohrey's display of color available from natural dyes. BLU members Tari Lohrey, Anne Bisdorf, and Lisa Rodenfels attended the fiber festival in Wooster, OH this weekend as vendors. 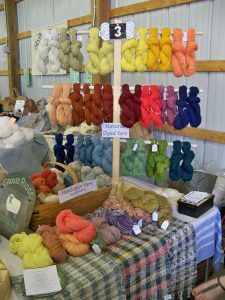 Between the three, BFL fiber was well represented; raw fleece, dyed locks, rovings, yarns, and some finished knitted items sold well in the booth marked with the big BLU banner. Fellow breeders Mike Lilburn, and Allen Fraley and daughter Alex were also in attendance. Somerhill had 2 BFL entered in the show and sale that is held in conjunction with the festival. Somerhill Nethy Bridge (Bo), yearling ram, and Somerhill Tabitha, yearling ewe were judged on Saturday, and then went through the sale ring on Sunday afternoon. As she did last year, junior BLU member Alex was gracious to offer to show the sheep for Somerhill, and did a wonderful job. The National Bluefaced Leicester show will be held at this venue in 2012. The BLU show will be held on Friday evening, and exhibitors will have the opportunity to enter their sheep in the sale on Sunday if they are so inclined. Start making plans to attend this show on Memorial Day weekend in 2012 ! This is the year to enter fleeces!